Some kittens view pups as their best buddies. Kittens are cute and fun to play with, but whether your dog agrees remains to be seen. 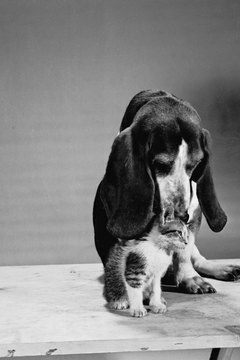 To encourage positive inter-species interactions between your new kitten and your pooch, introductions needs to be taken slowly. Fortunately, young kittens are very open to socializing with many types of animals, including dogs. If you are considering getting a feline companion for your pup, your best option is choosing a kitten. 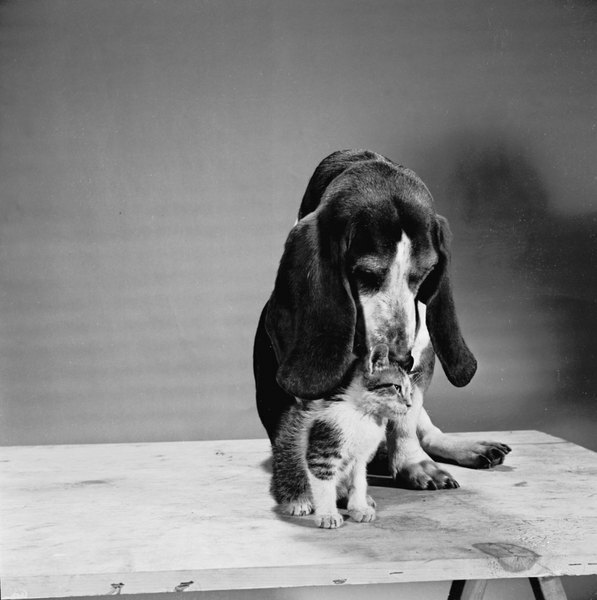 While an adult cat can be socialized to a dog, kittens are more open to forming friendships with animals usually considered to be predators, like pooches. During her first 3 to 4 months, your kitten doesn't have a fear of dogs and can develop a relationship with him more quickly than an older kitty, according to Vetstreet. Of course, this also depends on how open your pup is to befriending your new arrival. While some dogs adjust to the presence of a kitten easily, especially younger pups, others may not. Prior to adopting any new pets, watch your furry buddy's reactions to cats outdoors when you walk him or even when he's out in your yard. Does he growl, bark at or chase neighborhood kitties? If so, he may not adapt well to the presence of a delicate young kitten in his home. Generally, dogs that were raised around kitties as youngsters tend to make better companions for them later in life. Many shelters and breeders test pups prior to adoption to see if they are accepting of cats. When you adopt your pup, ask the shelter personnel if he is listed as cat-safe, especially if you later plan to adopt a kitten as his companion. When she arrives in your home, your kitten will likely be overwhelmed by her new surroundings. Give her a room of her own with food and water dishes, a comfy bed, toys to play with and a litter box. Once she settles in, tempt your pup over to the door to her room with some tasty doggie treats. Put a few treats on your kitten's side of the door and let the two sniff at each other for a few days under the door. If nobody is lunging, barking or growling at each other, crack the door open just a bit so that they can see each other face-to-face. Continue treating each pet for good, calm, non-aggressive behavior. If your pooch hasn't shown any signs of aggression toward your kitty, it's time for her to start roaming around your home. Keep your pup on a leash and don't foist the pets on each other. Instead, simply sit calmly with your leashed pooch and let your kitten start exploring her environment. If the kitten approaches you and your canine companion, start giving tasty treats to both her and the dog. Pay equal amounts of attention to both pets, so that your dog doesn't feel jealous of your feline addition to the family. Continue to leash and supervise your pup around your kitten until she's at least 4 months old. Give your kitty plenty of places to escape to, such as kitty shelves, and spots to snuggle, so she won't encroach on your pup's favorite spots, like his bed. Teach your pup some basic obedience commands prior to adopting a kitten. These commands allow you to control him in his interactions with the little furry baby. Young kittens are very delicate, so discourage any type of rough play between your kitty and your pup. Your pooch may not mean to harm your little one, but easily can because of her small size. While older dogs can get along with kittens, if your pup is ill and somewhat sedentary, a rambunctious little kitten may not be the best companion for him in his golden years. If, during the initial introductions, you notice that your dog is reacting in a highly aggressive way toward your kitty, the match may not be appropriate. To avoid a potential tragedy, contact an animal behaviorist to work with your dog or consider finding a new home for your kitty. Sacramento SPCA: Puppy, Kitten or Adult? RSPCA Australia: How Do I Introduce My New Kitten to My Older Dogs? My Healthy Cat: Can Your New Cat and Dog Get Along? How Does One Tame a Wild Kitten That Is Over Two Months Old? When Should a Kitten Be Given Cat Food? Is Coccidiosis a Kitten Illness? Can Kittens Transfer Anything to a Puppy? What Can Happen If a Kitten Gets Separated Too Early?